Celebrate the strengths and resilience of Aboriginal and Torres Strait Islander cultures! 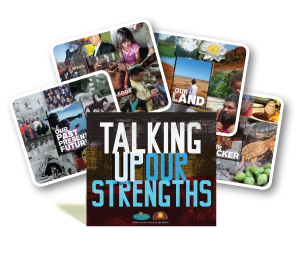 Talking Up Our Strengths is a set of 22 evocative, photomontage cards that celebrate the strengths and values of Aboriginal and Torres Strait Islander cultures. These family snap-style photos show people being ‘strong in culture’. They are designed to foster recognition of what Aboriginal people have done—and continue to do—to nuture pride, identity and resilience. These cards are conversation triggers for use in different places and different situations. The themes featured on the cards include our children, knowledge, Elders, land, music, health, connection, and our past, present and future. These cards can be used as visual aids for sharing stories—stories that strengthen pride in culture, and help nuture indigenous children to flourish and grow. as reminders of Aboriginal and Torres Strait Islander history, cultural richness and shared meanings. to focus on celebrations and activities within and between communities. to help a group open up and build relationships at the beginning of a workshop or class. to help people make connections between more abstract ideas and their lived experience. as reminders about the importance of all Australians taking pride in, and respecting, the cultures that have cared for, and been a part of, this land for so long. Talking Up Our Strengths is a visual feast and catalyst for conversations and storytelling in schools, communities, groups, social work settings, board rooms, family gatherings and back yards. 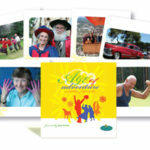 Whether they are spread out across the kitchen bench or on the tables of policy makers and politicians, these cards can be used as tools for reconciliation, social justice and pride in cultural diversity. Innovative Resources is proud to have published this resource in partnership with the Secretariat of National Aboriginal and Islander Child Care (SNAICC). What does it mean to belong? This was the question we contemplated with young people at St Paul’s Cathedral, Bendigo, a few weeks after NAIDOC Week in 2012. Conscious that NAIDOC festivities had recently passed—largely unobserved by the parish—we felt it was timely to hold our own informal celebration of aboriginal culture. We decided to hold a special evening of reflection on indigenous traditions and, in preparation, we visited the NAIDOC website to find out what activities we might incorporate into the event. One of the creative ideas we tried was to make an aboriginal painting, depicting the campfire or meeting place (our parish) with ‘u’ shapes (our people) gathered around. We also painted rivers representing the Loddon, Campaspe and Murray Rivers that run through our diocese. On the night, we each added our own fingerprint (a dot) to symbolise our belonging to the parish. Later in the evening, we talked about the different places and communities to which we belong, including our families, schools, sports clubs and, of course, the parish. To get the discussion rolling, we used Innovative Resources’ indigenous card set, Talking Up Our Strengths, as a conversational prompt. The following day, we took the painting to the Sunday Service, and members of the congregation were invited to dip their finger into the paint and add their own dot to the painting. There was a particularly touching moment when one of our local Karen members translated the meaning of the painting to other members of the Karen refugee community. They, too, added their own fingerprint dots to the painting, reinforcing its significance as poignant symbol of togetherness and belonging for the diverse cultural groups who are part of our parish. Understandably, some people were a little anxious about contributing to what might have been percieved as a faux aboriginal painting and preferred not to participate as a mark of their own respect for indigenous culture. Sometime after these events, I had the opportunity to chat to one of our region’s local aboriginal elders, and I was interested to ask her opinion about our actions. There are many different views about the best ways for people from non-aboriginal backgrounds to celebrate indigenous traditions, but she was very pleased and said it was a beautiful thing for us to do. More recently, I spoke with a general manager at St Luke’s Anglicare, who works to build partnerships with aboriginal organisations and support the care of indigenous young people. He reflected that when other cultures have come to Australia we have, by and large, welcomed their contributions and made them part of our cultural diversity. We love our Chinese food and Italian restaurants, but what, he asked, have we incorporated into our culture from our Aboriginal communities? He saw our painting as a way of embracing Australia’s indigenous heritage and was moved by its symbolism. When it comes to expressing respect for another culture, it’s sometimes difficult to judge how appropriate it is to deliberately borrow or emulate the practices of a particular tradition. But on this occasion, our dot painting and use of Talking Up Our Strengths provided an important opportunity for learning and appreciation for all involved. Next time NAIDOC week comes round, I hope we’ll be in the cathedral with our region’s Aboriginal elders. Perhaps we’ll work on a new picture together, placing our dots side-by-side to representing everyone’s belonging.